* Translates to "big bug of the salt water"
This insect's well-developed, grasping front legs are raised in a pincer-like pose in this photo by Julian Heavyside. ​This flattened oval-shaped, brownish insect can get up to 6 cm long. Its front legs are well-developed and adapted to grasping prey, while its flattened back legs are used for swimming. See BugGuide for more identification information; see iNaturalist for more photos. As its name implies, the giant water bug is found in and around aquatic habitats such as ponds, creeks and streams, marshes, and lake edges. It is a strong flier, and is attracted to lights at night. Giant water bugs are common and found throughout most of North America. They are active from spring to fall, and adults overwinter in mud in aquatic habitats. This insect is a predator, as indicated by its other common common names, 'toe biter' and 'fish killer'. It eats other aquatic invertebrates, small fish, and amphibians — such as this Pacific chorus frog. Like other members of Family Belostomatidae, the giant water bug may bite humans when disturbed. Bites can be very painful and may even cause permanent damage: upon biting prey the insect injects digestive enzymes to liquefy tissue that can then be sucked out. On humans this can produce a painful lesion. This Scientific American article delves into the giant water bug's predatory tactics and other interesting life history information. ​Haney, J.F. et al. (2013). Belostomatidae. An Image-Based Key to Stream Insects. University of New Hampshire Center for Freshwater Biology. Accessed 16/03/2018. Lethocerus americanus. (Leidy, 1847). In Klinkenberg, Brian. E-Fauna BC: Electronic Atlas of the Fauna of British Columbia [efauna.bc.ca]. Lab for Advanced Spatial Analysis, Department of Geography, University of British Columbia, Vancouver. Accessed 18/03/2018. 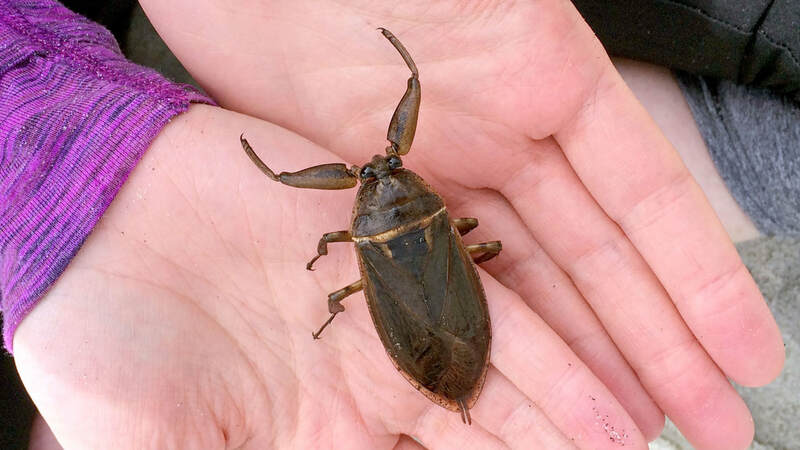 ​Species Lethocerus americanus - Giant Water Bug. BugGuide. Accessed 16/03/2018.